A SHANDON man played a vital part in the World War Two Battle of Kohima, a critical battle in the Burma Campaign. Lieutenant Colonel Robert (Rex) King-Clark MBE, MC, who died on December 29 2007 at the age of 94, commanded 2nd Battalion The Manchester Regiment — the machine gun battalion of the British 2nd Division — throughout the battle in Assam. Described as the "Stalingrad of the East", it was fought around the town of Kohima in northeast India from April 4 to June 22 1944, and marked the limit of the Japanese U Go offensive into India in 1944. The battle took place in two stages. From April 3 to April 16, the Japanese attempted to capture Kohima ridge, a feature which dominated the road by which the major British and Indian troops at Imphal were supplied. At this point, the small British force at Kohima was relieved, and from April 18 to June 22, British and Indian reinforcements counter-attacked to drive the Japanese from the positions they had captured. The battle ended on June 22 when British and Indian troops from Kohima and Imphal met at Milestone 109, ending the siege of Imphal. This was just one adventure in the colourful life of Colonel King-Clark, which included motor racing, flying, commanding a glider regiment, and writing books. His father, a stockbroker in London when the First World War broke out, joined the army in 1914 at the age of 42. He died of wounds exactly two weeks before the end of the war leaving his wife, two daughters and two sons, of whom Rex was the elder boy. After prep school in Sussex Rex went to Loretto, Edinburgh, with his brother Cuffy, who was shot down and killed over London in 1940 at the age of 22 whilst piloting a Blenheim night fighter of 23 Squadron RAF. From Loretto Rex went to Sandhurst where his nickname was coined by a fellow cadet — and he was known as Rex with great affection by all ranks for the rest of his life. To his considerable surprise he became a cadet sergeant and gained a blue for fencing, going on to win the Inter-Services foil event at the 1933 Royal Tournament. In February 1934 Rex was commissioned into the Manchester Regiment. This was through the influence of his sister’s father in law, Sir John Maclure, an ex-officer of the Manchesters who served on the Regimental Council. He joined 2nd Manchesters at Strensall, serving with them until 1937 when he joined the 1st Battalion in Egypt and served in Palestine and Singapore. The part of his life as a soldier which he enjoyed most was his six months in 1938 when, as a Lieutenant, he commanded one of Orde Wingate’s Special Night Squads against Arab Terrorists in the steep Galilean Hills of Northern Palestine. He was awarded the Military Cross and a certificate of Gallantry for this very special work. One Sergeant and ten other ranks from the regiment were with him, together with a number of Jewish soldiers with whom he remained friends for many years. In 1958, 50 years later, he went to Israel as a guest of the Government and was presented with a medal for his ‘Heroic contribution to the People of Israel’. In the 30s‚ Rex was able to indulge in a number of enterprising hobbies including motor racing at Brooklands and other tracks in Europe, Canada and the USA, and especially in flying. His adventures in these fields are told with enthusiasm and excitement in his autobiography of the 1930s, ‘Free For a Blast’ — the Clark slogan since 1646. He was a member of the British Racing Drivers Club. Flying became his main off-duty love and in the small black two-seat Cabin monoplane he owned from March 1937 to July 1939 he flew to 28 countries outside the UK, as far away as Bali in the East Indies. He revelled in his flying and was grateful to the Army which posted him to a variety of stations in a comparatively short time. The 1st Manchesters arrived in Singapore on October 1 1938. Earlier, in 1937, Rex had applied for a four year secondment to the Royal Air Force and this was approved in March 1939. But on arrival back in England Rex went to the War Office where he was told that he had never been heard of and that he was to return to his Battalion in Singapore after his leave was finished. Eventually all was sorted out and he was attached to the 2nd Battalion of the regiment at Aldershot, pending attachment to the RAF. But on September 1 1939 his pending attachment was cancelled and he was to stay with 2nd Manchesters for every day of the Second World War. Rex finally achieved his flying ambition and commanded the Glider Pilot Regiment in the UK between 1949 and 1952. He then went to Korea where he served with 28 British Commonwealth Brigade, which was followed by a welcome return to the Manchesters in 1953 in Berlin as Second in Command. His last military job was as GSO1 Land/Air Warfare Directorate where he played a major part in the formation of the Army Air Corps. After retiring from the army in 1958, the year he married Jean Campbell, he joined Calor Gas Scotland as regional manager, finally retiring in 1971. In 1963 he and his family moved to Amberwood, Shandon, where they lived happily for the next 44 years in their home overlooking the Gareloch, with Rex raising and lowering the regimental flag on his flagpole in salute on all occasions when HM ships sailed by. Rex always took great pride in flying the regimental flag when any member of the regiment visited the family. In retirement he and his wife Jean sailed a small 34 foot Nantucket clipper-bowed yawl called Pickle, which lay moored in the Gareloch off their home. Jean and his son Robert became as enthusiastic over fishing as he was, and in 1954 the family took an adventurous week on the Polanga River on the Kola Peninsula in Northern Russia where they caught a lot of salmon — but even more mosquito bites. 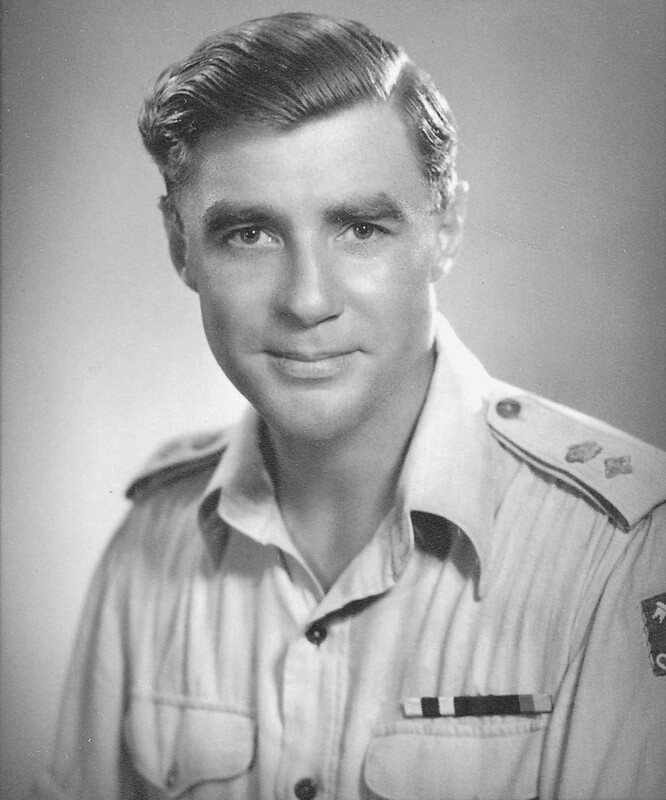 Rex wrote five books: ‘George Stuart Henderson VC’ (1975), ‘Free For a Blast’ (1988), ‘The Battle for Kohima 1944’ (1995), ‘Jack Churchill, Unlimited Boldness’ (1997) and ‘Forward From Kohima’ (2003). He is survived by his Jean, his son Robert, daughter Catharine, and grandson John Robert. The picture was taken in Bombay in 1945.